In the past four weeks, two international media houses have stated – accurately – that the Army Corps of Engineers is responsible for the levee breach events of August 2005. The two examples are noteworthy because in both cases, the flooding details were quite outside of the point of the story. And in both cases, the details were included as established facts; household knowledge if you will. UPDATE: Levees.org is in discussions with The Data Center of Southeast Louisiana. In the spirit of good will, the petition is temporarily suspended. We will update this webpage soon. The Data Center of Southeast Louisiana has a report on its website containing blatant falsehoods about what caused the 2005 flooding during Hurricane Katrina. 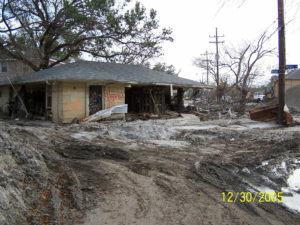 The report states Katrina’s destruction was caused by insufficient funding for maintenance. This is false. The report also states Katrina’s destruction was caused by errors in design. This is true, but the report doesn’t say the Army Corps of Engineers was responsible for them. These falsehoods – and many others in the report – shield the corps from blame for its mistakes. These falsehoods dishonor the thousands who perished. And the million who survived. Founder Sandy Rosenthal and the group Levees.org is featured in this WDSU TV news story the City of New Orleans plans to use $2.4 billion in FEMA money awarded to improve infrastructure and streets damaged in August of 2005 when the federal levees broke.